Termites similar to the ones used in the study. You might not be cool sending your elderly grandparents to front lines of war. But termites think differently—if grandma and gramps are already old and close to death, termites figure they might as well be the first casualties. At least, that’s what some new research suggests. 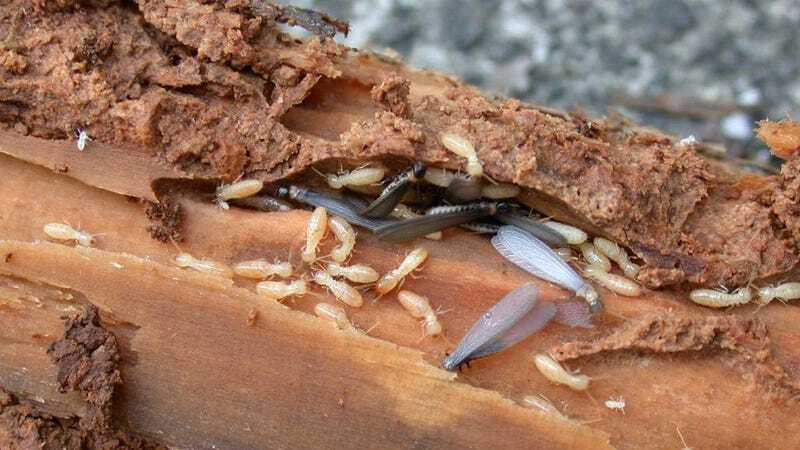 Termites have a class of workers who act as soldiers and do the riskiest things, like defending the colony from predators. Japanese scientists observing these soldiers’ behaviors found evidence that the front lines consisted of the oldest termites of the group. How do you prove who leads the termite charge? The researchers set up a fake nest: cylindrical cardboard chamber with a single exit. They put two soldiers and five workers inside, and then put a predatory ant near the exit. In dozens of trials, they looked at which of the two soldiers defended the colony by plugging the exit with their head. It was overwhelmingly the older one. And older female soldiers headed to the front lines more often than males. Additionally, the researchers observed larger nests, and found that it was more likely that the older soldiers would be closer to the nest exits, while the younger soldiers stayed closer to the queen. One termite researcher, Hannah Davis, who’s finishing her degree at the Freie Universität Berlin, told Gizmodo this was the strong evidence of age-based work differentiation. “We knew that older workers did most of the work in some species, but since older workers were bigger, it was hard to separate size (bigger workers just being better at everything) and age (older workers taking more risks because of their age).” But in this case, it’s not like young or old termites would be better at plugging a hole with their head. So sure, maybe our own human armies value the strength and vigor of young soldiers. But if we were termites, perhaps Dunkirk would have involved a lot more hearing aids and walkers. Due to an editing error, we accidentally said that the researchers used Neocapritermes taracua as the test subjects. They actually used Reticulitermes speratus termites. We have corrected and regret the error.